Remotely turn ON or turn OFF any (or all) the plug outlets & USB ports individually in App (Smart Life) on your Apple / Android phones wherenever you are, with WiFi or cellular network. You may set a different schedule for each plug, let your appliances automatically start work / stop work as you need. After configuration you can share the access with family members. It's so easy to use via APP or speaking that even the little kids or the elderly can remotely control the lamp / radio / TV to turn ON / OFF without leaving seats or touching power socket. The wifi smart surge protector works with 2.4GHz Wi-Fi without the need for a separate hub or paid subscription service. Use the full control mode or control 4 smart sockets individually with your smart phone through Wi-Fi network no matter where you are. 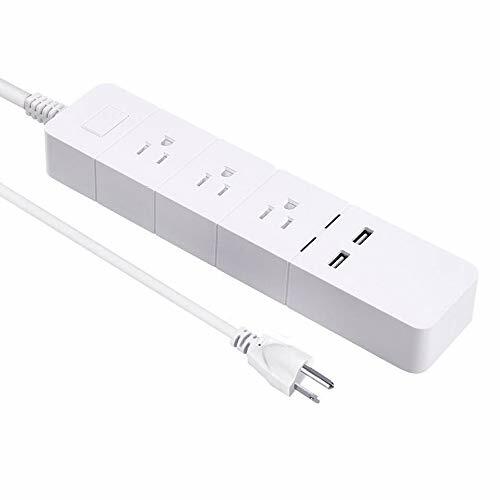 【Remote Control】This wifi smart power strip works with Alexa/ Goolge Home/Smartphone App. After connect this smart power strip to wifi network, you can remote control this smart power anywhere. 【Let the Intelligent Tide Come In】If you were outside and the device is still on, don't worry, turn off the wifi smart outlet power adapter by using your smartphone for remote control. Or you only need to say : "Alexa ,turn off..."
【Go Green and Control Your Life】We need to save energy for go green and electricity bills. You can set up an automated on-off schedule to help you control the device that needn't keep opening. Working time, you make it works. Ending, the timmer schedule will make the device stop . 【Independent Control All plugs】 This multi outlet power socket equipped with 3 AC outlets and 2 USB , All 3 AC outlets and 2 USB Charging Port can be controlled individually, which is different from common power strip. 【Customized Protection for You】GeekBee smart plug is good Surge Protector, certification with FCC, ROSH, CE. Built in leakage, overload protection switch, product support Surge Protection, effective absorption of the sudden huge energy, protect the connection equipment from damage. 12-month worry- free warranty and friendly customer service. If you have any questions about this product by GeekBee, contact us by completing and submitting the form below. If you are looking for a specif part number, please include it with your message.